This is a simple, earthy dish that goes well with pretty much anything — roast meat or poultry, steamed or grilled fish, or other veggies. 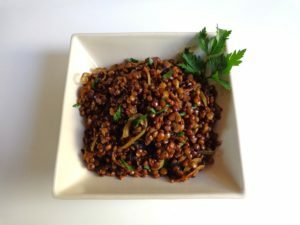 The spices enhance the nutty flavor of the lentils, and the onions add bite. A sprinkling of fresh herbs completes the dish. Use blonde lentils for this recipe. Preparation takes about an hour, including about 45 minutes of cooking time for the lentils. If you don’t have hot curry powder and want some heat, use regular curry powder and crumble in one dried cayenne pepper. Rinse the lentils. Cook in a large pot with the water until the lentils are just tender, about 40-45 minutes. Keep an eye on the pot and add more water if necessary. When the lentils are tender, add the salt. Turn off the heat, wait 5 minutes and drain. Peel the onion, cut in half lengthwise, and slice crosswise very finely. Heat the olive oil to sizzling in a large skillet. Add the onions and cook, stirring occasionally, until they are a deep golden brown, 10-12 minutes. Do not let them burn. Add a couple tablespoons of water and cook over medium heat until the water evaporates, about 5 minutes. Add the chopped herbs. Serves six as a side dish, or four as part of a vegetarian meal.